A workshop - Hum Honge Kamyaab was held for the recently inducted PDGM batch (2017-2019) on July 8, 2017 in the College auditorium that lasted for 3 hours and held the students in rapt attention. The workshop aimed at motivating the students to reorient their thoughts and actions to the new course, environment and the challenges. Mrs. Rashmi Aggarwal along with Brig. 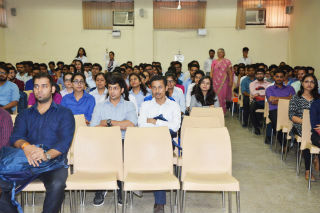 Sanjay Aggarwal addressed the students about how small changes in our lives can make a big difference. The workshop began with a striking message - we are responsible for who we become, urging the students to take responsibility of not only their achievements but also their failures. Sharing valuable advice on time management, Mrs. Aggarwal emphasized on prioritizing the work on the basis of their urgency and importance. To explain the importance of time & energy management further, she explained the 80/20 rule of management according to which 20% of energy should be used to get 80% of the output. With the help of a video clip the acceptance of change was highlighted. 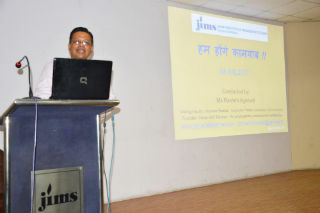 Brig S. Aggarwal took the workshop further by sharing his experience as a trainer. He discussed the very famous 7 habits of highly effective people that make them successful. He focused on emotional intelligence and its unchallenged importance in interpersonal relations and workplace culture. The workshop concluded on a triathlon video that presented an enthralling example on team work. 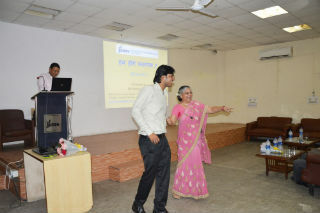 With the help of various relatable examples and discussions, Mrs. Aggarwal and Mr. Brig. 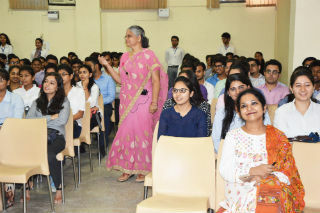 Aggarwal succeeded in infusing a lot of encouragement amongst students who seemed to be enthused and hummed to themselves - Hum honge kaamyaab.